Genuine Blackhawk! brand STRIKE Single Rifle Ammo Pouch in Coyote Tan. Ex UKSF issue kit, condition is obviously used, and some examples have minor damage. Single compartment pouch taking 2x 30 round 5.56mm magazines. Will also accept AK type mags. 2 AK mags will fit but can be a little tight for some users tastes. Flap is velcro attached and therefore both detachable and height adjustable. Height adjustment allows carriage of high capacity 5.56mm mags or AK mags. Removal of flap allows very swift reloads. Elastic strap around the pouch maintains a secure fit for open top even with single mags and eliminates rattle for 2 mag carry. 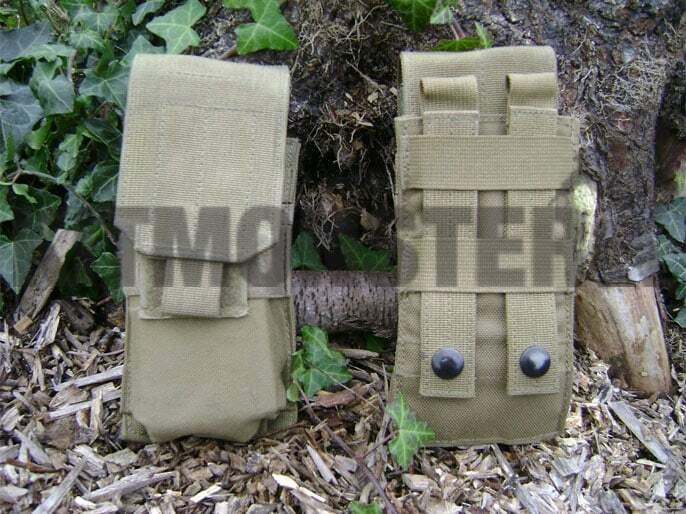 As these pouches were primarily designed for M16/M4 Colt Magazines, HK 416 and SA80A2 mags can be a tight fit. Some previous UK users have removed the elastic strap, and therefore this may not always be present. 2 views shown single pouch supplied, L85A2 mags for illustration only, not included.